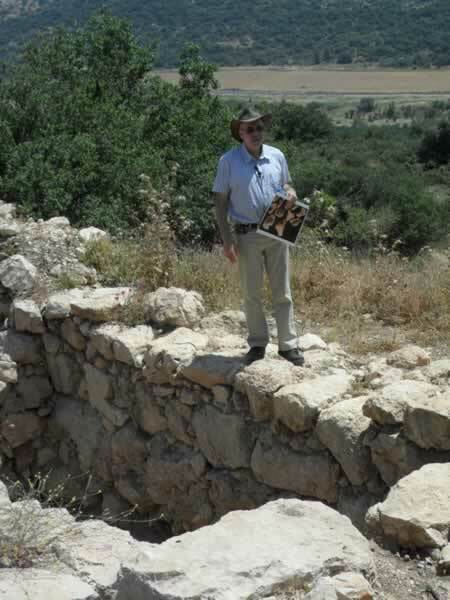 After five seasons of excavating at Khirbet Qeiyafa - a fortified city in the Elah Valley 30 km southwest of Jerusalem near where the shepherd David felled the Philistine giant Goliath, Prof. Yosef Garfinkel of the Hebrew University here has uncovered cultic artifacts from a 3,000-year-old Iron Age community which he claims revolutionize archaeologists' understanding of Solomon's Temple. And if that weren't enough, the discoveries at Khirbet Qeiyafa also weigh in on a crucial argument between academic maximalists and minimalists concerning whether King David ruled over an empire, a small kingdom or a minor Bedouin fiefdom - or indeed if he was a mythological rather than a historic figure. At a press conference here to mark the publication of the new book In The Footsteps of King David in the Ella Valley: Surprising Discoveries in Biblical Archaeology (Hebrew) co-authored by Garfinkle, Saar Ganor and Michael Hasel, followed by a tour of the site, Garfinkel displayed three unique artifacts discovered at Khirbet Qeiyafa. 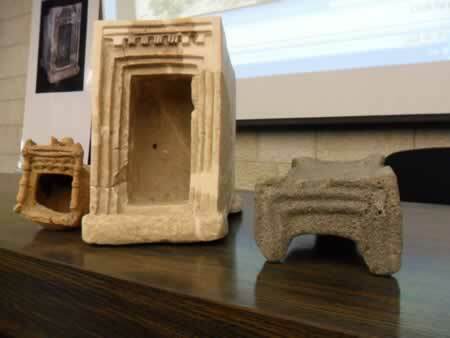 Two are small containers or shrine models, one of clay and the other chalk stone. The third is an even more unique tray-like basalt bowl, perhaps an altar; all three reveal decorative motifs which shed light on the Temple erected by King Solomon c. 960 BCE. No contents were found associated with the models, which were smashed and have been pieced together. Based on holes in the sides of the models, Garfinkel suggested they were closed with a curtain (parochet). The 20-cm-high clay model is the oldest artifact ever found which displays "slaot" - an obscure Hebrew term used to describe Solomon's palace in 1 Kings 7:1-6. The Koren Bible, translated by Harold Fisch, renders "slaot" as beams. According to Garfinkel, the term can now be understood as "triglyphs" - an ornamental motif of three parallel vertical lines that until this discovery was thought to first appear on the Parthenon in Athens some 400 years later. The clay container features a decorated opening flanked by lions and two pillars that Garfinkel says recall "Boaz and Yachin" - pillars that flanked Solomon's Temple, according to the Bible. The 35-cm-tall stone ritual box is decorated with a triple inset motif. Garfinkel claims this is an illustration of the term "shequfim", which was usually understood as referring to nine windows in Solomon's palace. Instead he posits the obscure term can better be translated as a "triple recessed doorway." "Similar triglyphs and recessed doors can be found in the description of Solomon's Temple (1 Kings 6, Verses 5, 31-33), and in the description of a Temple by the Prophet Ezekiel (41:6). These biblical texts are replete with obscure technical terms that have lost their original meaning over the millennia. Now, with the help of the stone model uncovered at Khirbet Qeiyafa, the biblical text is clarified. For the first time in history we have actual objects from the time of David, which can be related to monuments described in the Bible," says Garfinkel. The Hebrew University professor's remarks were seemingly directed at Israel Finkelstein, a controversial Tel Aviv University archaeologist and co-author of the 2001 bestseller The Bible Unearthed: Archaeology's New Vision of Ancient Israel and the Origin of Its Sacred Text. There Finkelstein and co-author Neil Asher Silberman questioned whether King David even existed. "All the people who say there was no Temple of Solomon in Jerusalem have a problem. David and Solomon didn't invent a new architecture. They took existing forms. And that's what we see here," said Garfinkel. The professor was careful to distance himself from the often acrimonious disputes in Israel's archaeological community. His background is the Neolithic rather than the Iron Age, he emphasized. Prior to digging at Khirbet Qeiyafa, he had no preconceived opinions about the question of the nature of David and Solomon's kingdom, he said. What tipped his theory, he said was the Carbon-14 dating of five olive pits found at the site. The analysis, done at Oxford University in Britain in 2008, revealed a time frame ranging from 1020 to 980 BCE - corresponding to the biblical account of David. Garfinkel identifies Khirbet Qeiyafa - which extends over 2.3 hectares - with David's city of Sha'arayim. Taking a middle position between the minimalists who question if David existed and the maximalists who argue his empire stretched from the Nile to the Euphrates rivers, Garfinkel says the much-mythologized kingdom encompassed the Shephala lowlands near the site as well as highlands around Hebron and Jerusalem. No evidence of pigs was found among the debris of sheep, cattle and goat bones at Khirbet Qeiyafa, he said, suggesting the city did not belong to the Israelites' arch-enemy the Philistines. Similarly the pottery found there was different than the shards found in Philistia. Nor were any figurines or human depictions found there, perhaps reflecting the fourth of the Ten Commandments against making graven images. More crucial in Garfinkel's identification were the fortifications. The stone ramparts, which still stand to a height of 2-3 meters and have a circumference of 700 meters, consist of a casemate wall - that is an exterior wall, a hollow space and then a second wall. In places, houses abut the casemate - an urban design typical to cities in Judah at the time but not found in the five Philistine cities of Gaza, Ashkelon, Ashdod, Gat and Ekron. What makes Khirbet Qeiyafa unique as an Iron Age site, said Garfinkel, was the discovery of two gates, whence his identification with Sha'arayim - which means two gates in Hebrew. What of the future of Khirbet Qeiyafa, after Garfinkel finishes excavating there in 2013? "Our dream is that the site will be accessible to the public. Whether it will be the National Park Authority or the Jewish National Fund, I don't know," he said. 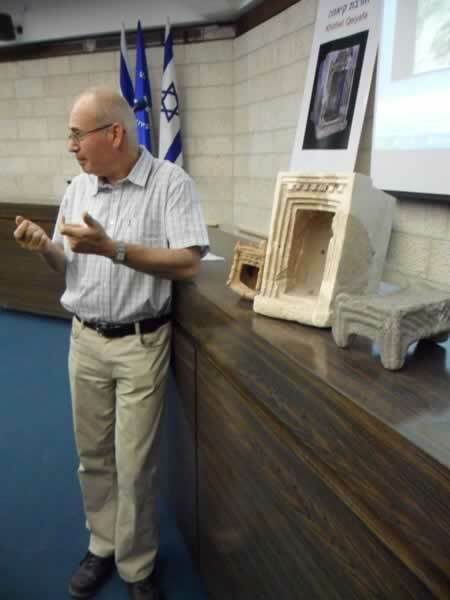 But Saar Ganor was more specific about the Israel Antiquities Authority's plans. Pointing to several construction cranes on a nearby hill, the IAA archaeologist said that city of Ramat Beit Shemesh is zoned to expand to encompass Khirbet Qeiyafa on three sides. The IAA is hoping to push back those future boundaries so as to allow room to preserve the site. It's a question of funding, he said. "When you finish (excavating), you have to either cover it or develop it." Khirbet Qeiyafa's immediate future may be to be filled in by a backhoe pending its ultimate preservation.